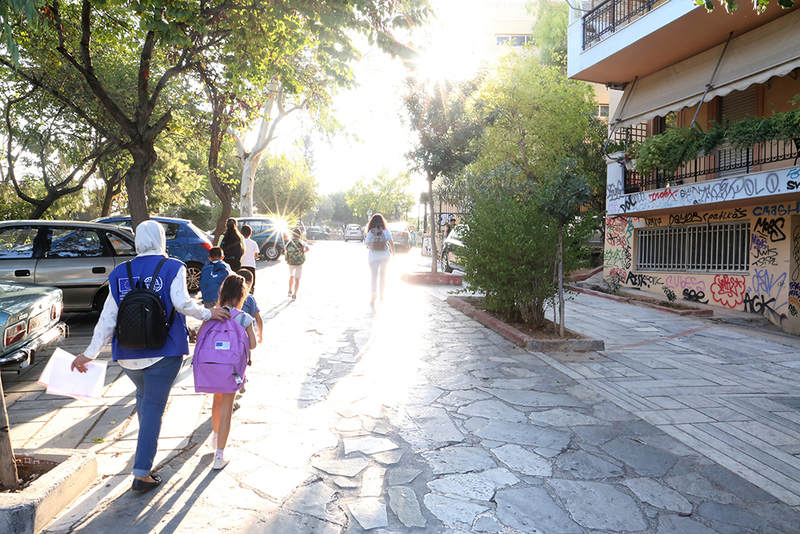 Athens – Access to regular schooling has enabled migrant and refugee children to make friends with students from other cultures, said 84 per cent of surveyed children in open accommodation centres in Greece. The findings of the survey, conducted by IOM, the UN Migration Agency, reveal the quality of community relations is directly affected by students’ personal experience with the educational institutions. Results indicate that satisfaction with the daily school experience is an essential precondition for the integration of students in the education system. “I enjoy going to school and my favourite subject is English, but I also want to keep learning Greek. I really like the Greek language,” said 10-year-old Sidad, from Iraq. “When I grow up, I want to be an interpreter. I don’t have any Greek friends yet. But we go to school together every day and play ball during the breaks,” he continued. Survey data also demonstrated that most respondents (62%) had prior formal education in their home countries. The vast majority of surveyed children (84%) reported to have either made friends or regularly interacted with Greek and other students and have smoothly integrated into the school environment. Senior high school students were evidently more engaged in attending classes, as the drop-out rate was just over 11 per cent, compared to 30 per cent among primary and 27 per cent among high school students. Incidence of drop-outs can be attributed to various factors, including outflows from sites and the movement of families to urban areas, or even to other European countries such as through the EU Relocation Programme, which ended in March 2018. Prioritizing the attainment of basic needs such as food and shelter was another factor affecting drop-out rates. “It is beyond doubt that education is key to helping migrant and refugee children settle in their new home and prevent them from feeling ostracized from the world around them,” said Gianluca Rocco, IOM Greece Chief of Mission. “IOM is proud to support the Government of Greece in this important effort to facilitate social cohesion in Greece,” he added. Simona Moscarelli, IOM Greece Programme Officer, explained that the will to attend school even against high odds demonstrates the high value students place on learning and adapting to a new culture. “In our experience, we have seen that regular attendance shows a real motivation to not only learn but also become part of the community and return to normality, especially given the fact that the school attendance is not mandatory for migrants and refugees in Greece, and a large number those who choose to send their kids to school do not consider Greece a permanent place to live,” said Moscarelli. During the 2017-2018 school year, IOM ensured the transportation of 2,800 migrant and refugee students to schools. Seventy-three per cent attended classes in primary schools, 21 per cent in high schools and nearly 6 per cent in senior high schools. Fifty-six per cent were boys and 44 per cent were girls, while the vast majority (91%) were of Syrian, Iraqi and Afghan origin. 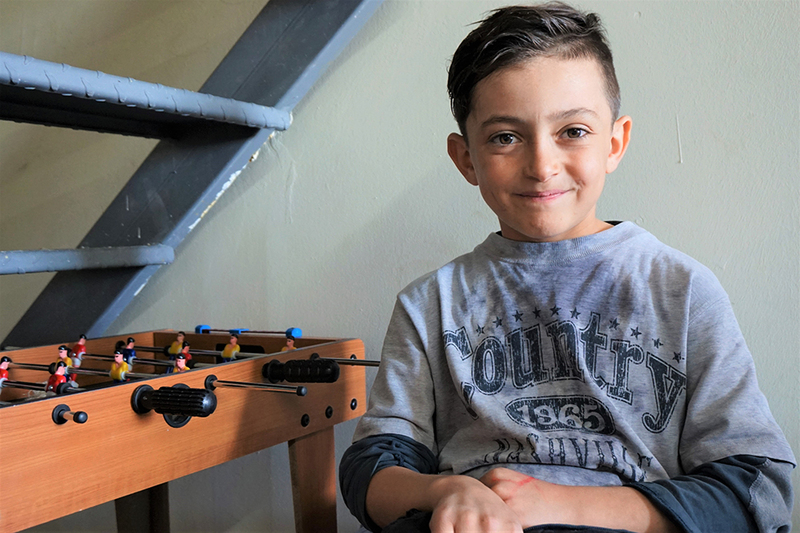 Funded by the European Commission, the transportation of migrant and refugee children from accommodation sites to schools was part of the “Humanitarian and Recovery Support to the Affected Population in Greece” programme for the 2017-2018 school year.